Verifying student IDs on campus is a vital task for any institution. But as the modern campus continues to evolve and the number of ID verification environments grows, so too does the need for flexibility and mobility in how student IDs are verified. In this 25-minute, on-demand webinar hear how campuses can leverage existing smartphones to log attendance and other vital student traffic information all while scanning the full range of campus card technologies. In the webinar, we’ll discuss specifically the PockeTracker solution from Vision Database Systems, which leverages sleds — or pieces of hardware that attach to a smartphone to scan student IDs — and the solution’s backend system that handles reporting and privileges. The solution has already been deployed at campuses across the country, and joining the webinar is one of the institutions that is using PockeTracker to it’s fullest potential — Madison Area Technical College. 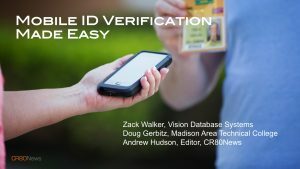 Hear how Madison College is using mobile ID verification solutions from Vision Database to monitor access to its campus health clinic, issue valuable city bus passes to students and monitor student access to the College’s campus-to-campus shuttle service.